Leadership Questions for Health Care Professionals: Applying Theories & Principles to Practice by Dr. Matthew R. Kutz presents some of the most common leadership questions with the intent to facilitate curiosity and dialogue about the general concept of leadership and an awareness of potential leadership issues facing health care professionals. Leadership Questions for Health Care Professionals presents responses that will initiate discussion, as well as offer solutions based on the best available evidence across a wide spectrum of relevant research. Discussion questions at the end of each response will allow the reader to engage in critical thinking and re-evaluate their experiences and offer new insights into their leadership journey. 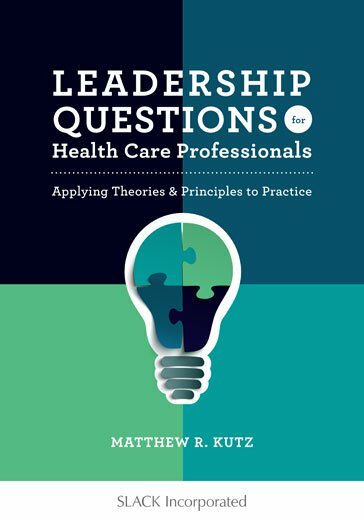 Leadership Questions for Health Care Professionals takes an interprofessional and interdisciplinary approach and is relevant for athletic trainers, physical therapists, occupational therapists, speech-language pathologists, nurses, physicians, and more. Leadership Questions for Health Care Professionals: Applying Theories & Principles to Practice offers students a broader conceptual understanding of leadership, as well as the depth required by seasoned health care clinicians, managers, and executives who are looking for practical and evidence-based insights to their toughest leadership issues. Question 1 Why Does Everyone Make Such a Big Deal Out of Leadership? Question 2 So, if Leadership Is so Important, What Is It Exactly? Question 3 I Learned A Lot of Management in College—Is That the Same as Leadership? Leadership That Informs My Leadership Journey? Who Demonstrates Leadership Behaviors a Leader? Question 6 Can Leadership Be Learned, and if so, How? Ideas Attached to It—How Has Leadership Evolved Over Time? to Be a Valuable Contributor to My Team? How Do I Navigate Difficult Coworker Relationships? Develop Good Relationships With Coworkers? Good Team That Performs Well? Teams Made Up of a Variety of Different Professionals? Well With All the Members of My Team? Question 17 What Is Followership, and How Is It Possibly Related to Leadership? What Is the Difference Between Change and Innovation? Better Way to Do That? Will That Balance Reduce Burnout? What More Do I Need to Know About Leadership? How Can I Diagnose the Organizational Culture Around Here? Question 24 What Is a VUCA Organization, and Why Does It Matter to Me? Nuance of Complexity to Others? Can I Transfer My Leadership Skills Somewhere Else? Ethical Leadership? Shouldn’t That Be Natural? Question 28 How Can I Get More Power at Work Without Manipulating People? Came From Globalized Health Care? Cultural Competence Seem so Divisive? Now I Need to Be Concerned About Different Cultures’ Worldviews? Matthew R. Kutz, PhD, AT, CSCS is an Associate Professor of Exercise Science and Sports Medicine in the College of Education and Human Development at Bowling Green State University, a 2013 Fulbright Scholar in the Medical Sciences (University of Rwanda, College of Medicine and Health Science [formerly Kigali Health Institute]), and a 2016 Visiting Research Fellow and Visiting Scholar at Gold Coast University Hospital and Griffith University, College of Medicine, Health Service Management (Queensland, Australia). Matt is a Senior Associate Editor of the Athletic Training Education Journal, a member of the National Athletics Trainers' Association International Committee, and a member of the Commission on Accreditation of Athletic Training Education Ethics and Professional Standards Committee. In addition to his international and professional service, Matt is the award-winning author of Contextual Intelligence: How Thinking in 3D Can Help Resolve Complexity, Uncertainty, and Ambiguity (Palgrave MacMillan) and Leadership and Management in Athletic Training: An Integrated Approach (Jones and Bartlett).